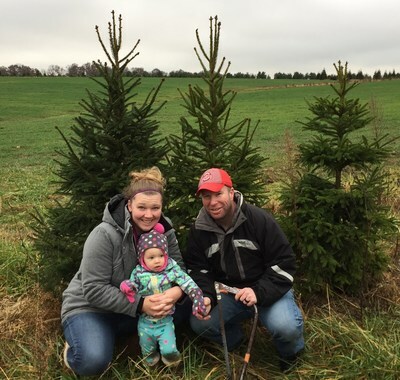 CINCINNATI, Dec. 30, 2016 /PRNewswire-USNewswire/ -- Wounded Warrior Project® (WWP) recently took veteran families to a farm near Cincinnati to help them pick the perfect Christmas tree. Opportunities like this provide a social atmosphere that encourages wounded warriors to get out of their homes and connect with other veterans and families. In a WWP survey of the injured warriors it serves, more than half of survey respondents (51.7 percent) talked with fellow Operation Enduring Freedom, Operation Iraqi Freedom, or Operation New Dawn veterans to address their mental health issues. The recent connection outing to Hamersville also gave warriors a chance to spend more time outdoors with their families. Army veteran Randy Moore and his family didn't pick a tree because of allergies, but they still enjoyed the gathering. "A big highlight for us – dinner and time with other veteran families," Randy said. "My kids loved making Christmas ornaments." As part of the trip to Corsi Tree Farm, injured veterans and their families enjoyed live music, a petting zoo, food, and had a chance to learn about WWP programs and services. WWP programs assist warriors with mental health, physical health and wellness, career and benefits counseling, and connecting with other warriors and their communities. Because of the generous support of donors, connection events like this – as well as all programs and services – are free of charge for warriors, their families, and their caregivers. "To me, Wounded Warrior Project means family," Randy said. "The organization is always there when you need it."